Program Note: Tune in to hear Gary Tuchman's full report tonight on AC360° at 10 p.m. ET. Gary Tuchman learns about curling and the economy in Fargo, North Dakota. 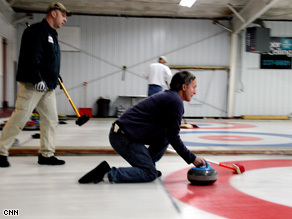 Gary Tuchman tests out his curling skills in Fargo, North Dakota. What ever happened to the days of low unemployment, a decent housing market, budget surpluses; a robust economy? Those days are still here! But likely not where you are. They are where I am right now. Fargo, North Dakota. The currently frozen city of 98,000 people where the temperature is zero fahrenheit as I write this, has an unemployment rate not much higher than that. In a nation where 7.6 percent of people are out jobs, Fargo is at 3.4 percent, a rate which is recognized by most economists as "full employment." Realtors expect continuing increases in housing sales; the North Dakota state budget has a one billion dollar surplus. Say the word recession to Fargoans, and you might hear them say, "What recession?" Fargo is part of a region that is doing relatively well economically right now. Parts of North Dakota, South Dakota, Wyoming, and Utah are escaping much of the economic wrath of the great majority of the rest of the nation. But Fargo seems to be one of the brightest spots of all. We went to this city made famous by the dark comedy of the same name to find out why. North Dakota has oil and that has helped greatly, but so do other parts of the country. What many business people in North Dakota think makes them different is what they call "their upper midwest Scandavian sensibilities." Many of the immigrants who immigrated to North Dakota generations ago from Norway, Finland, and Sweden came here with a sense of financial practicality and conservatism. It lives on. For many years, bankers in Fargo have been very conservative about loans and mortgages. One of the largest banks in North Dakota, Gate City Bank, tells us it only had a handful of foreclosures this year. The CEO of the bank says 2008 may have been the best year ever for his institution. They brag they will not accept a penny of TARP funds, and celebrate their good fortune by giving out homemade cookies in the 28 branches around the state. We talk to one of the bosses of a high-tech firm who says he needs to expand his employee list by 50 percent because he can't keep up with all the business. We talk to an ironworker who says there is so much work he doesn't have to worry about jobs. We go to a curling rink (curling is a big sport in North Dakota) and hear from the curlers that they feel the economy is pretty good. Now, we must point out Fargo is not nirvana. The low unemployment rate has inched up, some businesses say they are seeing slight decreases in revenue, so there is concern the rest of the nation's problems could catch up to them. But everyone we talk to here recognizes they are fortunate. The recession is issue number one in this great nation. But in Fargo, it's currently viewed as an out of town story. While this is an interesting article, I feel Mr. Tuchman's article is a bit short-sighted. Fargo may be the largest 'city' in North Dakota', but it is not the only city nor does it have the only businesses in the state that keeps it in the black! North Dakota has the only state-owned bank and the only state-owned grain elevator in the United States. The Bank of North Dakota was started in 1919 to avoid high interest rates when borrowing from banks in Minnesota. The Bank's purpose is to further agriculture, business, and growth for North Dakotans. Also, while curling is a winter sport here it is definitely not the only sport popular, hockey, football, all the 'normal' sports one would expect! I am a business owner in Fargo (flooring and kitchen & bath). We don't get the extreme highs or extreme lows when the economy swings way up or down. I came here many years ago from Pennsylvania, and wouldn't trade this place for PA or any other (except maybe Hawaii this time of year)! I just want to say to some of the others who have commented on the article; the Fargo-Moorhead area has a population of around 200,000 and we are not a bunch of uneducated, small town hicks. Our economy is diverse, our people well educated and our leaders don't spend every penny of our taxes. I've always said, "this is the perfect place to live except for the weather in winter." Gary – GEM electric cars are manufactured in Fargo, North Dakota and have been for 11 years! 2008 was our "best year ever." Consumers, colleges/universities, state & local governments, even the miIitary and Capitol Hill drive 'em. Obama's new stimulus plan makes it even more affordable too. Who out there drives GEM cars? Great news for Fargo! Just three hours south, our town of Aberedeen, South Dakota (population 25,000) is feeling the same optimism. While we have had some layoffs from manufacturing plants the community is in a big push to grow. We need houses and struggle to get them and apartments built, we're having a massive job fair on March 17 with dozens and dozens of companies participating. We have a great climate for entrepreneurism, lots of space to grow, buildings ready to move into, and a regional workforce which travels to town from upwards of 50 miles one way. Everyone's talking recession, but sales tax is up, visitor spending is up and companies are hiring. OK, just to add my two cents worth...let's stop bickering about republican vs. democrat vs. the world...isn't it enough that we all have issues? North Dakota or New York – what difference does it make? WE as a nation are in major debt and what are WE going to do about it? I am from North Dakota and no, the recession hasn't hit big here...YET, but it will eventually make it's way into the state, just like everything else does. That doesn't make us immune from the financial virus that has attacked our nation, and our world. Take a hint from North Dakota and other conservative states – you DO NOT need to have the best of everything to live. You DO NOT need to make more than anyone else to be happy. Living extravagantly and beyond your means is what gets people into financial trouble – and the nation's government is not exempt from that statement. One more word of advice – let's take care of OUR OWN before we worry too much about everyone else. Without "US", there won't be anyone left to take care of "them". Oh & Curling????? Not all that popular. Drinking however is...we are the 5th "drunkest" city in the US. Well...I live here. My fellow co-workers & I are on a constant anxiety "high" not knowing if we are "next" or not. Fargo is not isolated from the recession & I am tired of hearing we are. I currently have 5 friends who have lost their jobs in the last month or so & it is not uncommon for people to have 2 or 3 jobs because the pay is so horrible here. I work for a major hotel developer...no financing=no building=no work. Also – we have a main HQ for Microsoft...just laid off 50 people along with some other large companies. Yes we are better off....NO – we are definitely not isolated.